Justin Timberlake answered questions about his second Super Bowl halftime show Thursday in Minneapolis. Stefan Holt reports. Justin Timberlake is getting another chance. Fourteen years after the infamous wardrobe malfunction that sparked the most backlash of any Super Bowl halftime show, Timberlake will be back at midfield on Feb. 4, but this time as the solo headlining act. Much has changed since the singer’s infamous flub -- he’s released three platinum albums, toured three times and found roles in a few movies, like "The Social Network," "Friends With Benefits" and "Trolls." He’s also gotten married to actress Jessica Biel and become a father. In 2004, Timberlake was fresh off his first solo album, just a few years removed from '90s boy band 'N Sync, when he was asked to join headliner Janet Jackson for the Super Bowl XXXVIII halftime show. As he sang the last line of "Rock Your Body" to close out the show, he grabbed at Jackson’s chest to pull off part of her costume, but inadvertently revealed her breast on live television. In a statement after the performance, Timberlake apologized for the malfunction and said the infamous reveal "was not intentional and is regrettable." In an interview with MTV in 2006, the singer said he could’ve handled the fallout better and thought Jackson suffered more consequences from the incident than he did. In a radio interview previewed on Jan. 17, Timberlake reiterated that he "stumbled" after the infamous incident. When asked if he resolved the issue with Jackson, he said, "Absolutely." "And I don't know that a lot of people know that," he added. "I don't think it's my job to do that because you value the relationships that you do have with people." 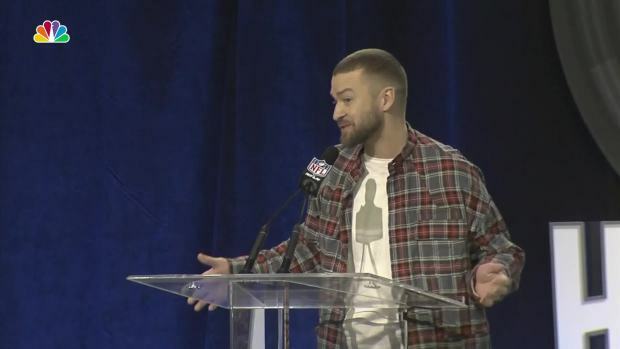 Justin Timberlake fielded questions from reporters about his upcoming Super Bowl halftime performance, a record for an individual performer, and was asked if there might be a surprise N'Sync reunion, as well as what he thought of Tom Brady listing him as one of his "man crushes." 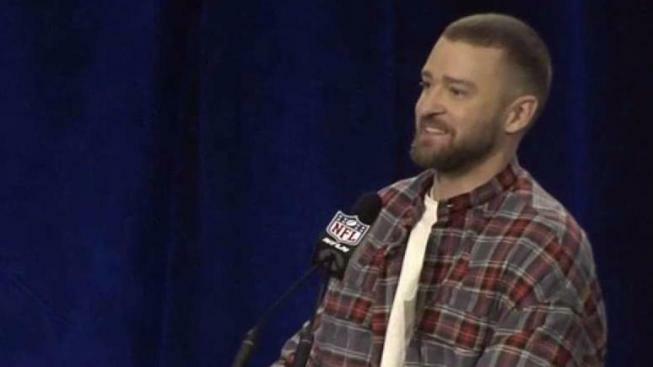 Timberlake insinuated in a Super Bowl press conference that he intends to use the stage for himself, responding to the rumored guest appearances ranging from 'N Sync to Jay Z to Jackson herself. He said his band, The Tennessee Kids, would join him onstage and predicted a show that will include things "never done before." 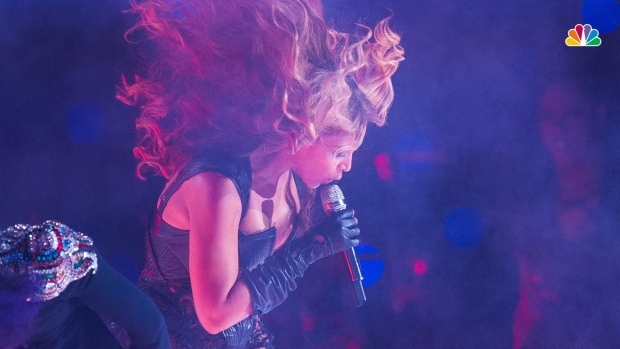 Nowadays the Super Bowl halftime show features some of the biggest names in pop music. But not too long ago, the halftime show was mostly marching bands and musical ensembles. In 1992, FOX encouraged viewers to turn off the Super Bowl by airing a live episode of the sketch-comedy show “In Living Color” during halftime — and big names have headlined the mid-game break ever since. The infamous wardrobe malfunction led to a mandatory five second delay on all future NFL halftime programming to ensure that explicit material was not fully aired. Other Super Bowl halftime controversies in recent years have paled in comparison to "Nipplegate." In 2007, pop sensation Prince did an iconic rendition of "Purple Rain" as it poured. His uniquely-shaped guitar was compared to phallic imagery, and when a large sheet on the stage broadcast his silhouette, the projection of the guitar was seen to some as risque. In 2012, singer M.I.A. joined headliner Madonna on stage and flipped the middle finger during her performance. The NFL sought $16.6 million from M.I.A. for the gaff; the singer and the league reached a confidential settlement. 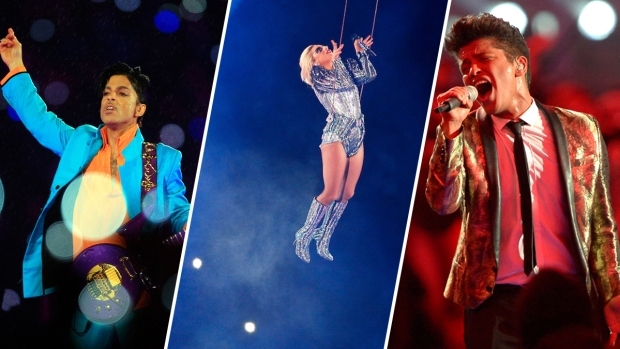 Last year’s halftime show was the most-watched halftime performance in the history of the Super Bowl, according to the NFL, with more than 150 million tuning in to see Lady Gaga light up the stage. Timberlake announced he would perform during halftime in October, in a skit with pal and NBC star Jimmy Fallon, who asks for the time. He reveals that he does, indeed, have the time -- half the time, that is. His performance comes days after he dropped his new album, "Man of the Woods," which he announced on social media on Jan. 3. On Jan. 8, Timberlake announced a tour, which kicks off in Toronto on March 13. Super Bowl LII marks Timberlake’s third time performing at halftime, the most appearances by any individual entertainer, according to the NFL. He performed with 'Nsync at Super Bowl XXV in 2001 before the infamous duet with Jackson during Super Bowl XXXVIII. Tune in to see Timberlake’s halftime performance during Super Bowl LII, on Feb. 4, 2018, on NBC.